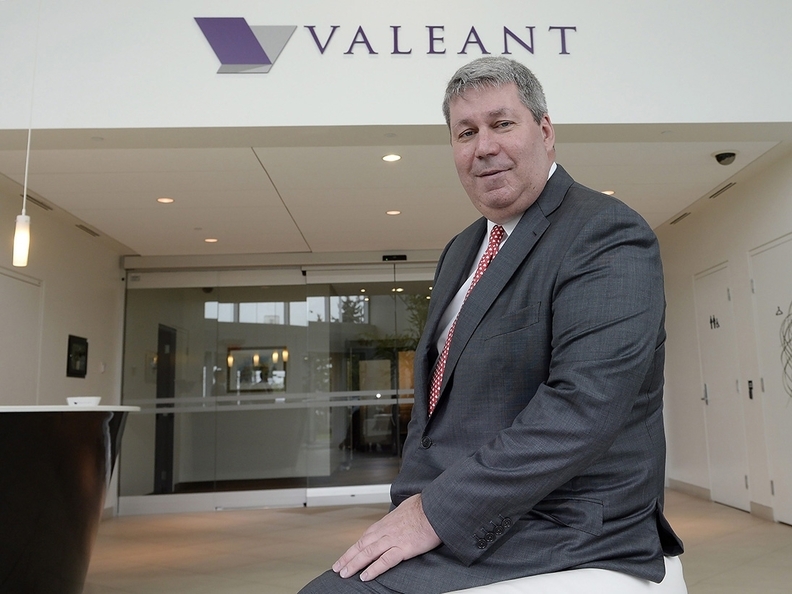 The chief executive of embattled Valeant Pharmaceuticals, J. Michael Pearson, has agreed to be deposed by a Senate committee investigating the causes of soaring prescription medicine prices. Meanwhile, the Canadian drugmaker has received a notice of default from some bond holders because it hasn't filed a financial report due in March. That's been delayed by a review of company accounting practices, which found Valeant prematurely reported $58 million in sales in 2014 to its former partner, mail-order pharmacy Philidor. Valeant now is revising earlier financial statements related to that. Valeant Pharmaceuticals International. said the default notice was filed by holders of its 5.5 percent notes due for repayment in 2023. To resolve the default, Valeant must file its 2015 financial report by June 11, but it expects to do so by April 29, the company said in a statement. If it doesn't file by June 11, Valeant would be in default and bond holders could demand accelerated repayments, Citi Research analysts wrote to investors Wednesday. Due to the default notice, Moody's Investors Service lowered Valeant's speculative grade liquidity rating by one notch and said its other ratings are under review for a downgrade. Those are just the latest headaches for a company that was a Wall Street darling as it rapidly expanded through acquisitions, driving up its stock price. Those deals left Valeant saddled with $30 billion in debt, and it now faces three federal probes into its accounting and business practices. The intense scrutiny of Valeant's pricing and other practices since last summer triggered repeated sell-offs of its shares. They have lost nearly 90 percent of their value since a peak of $263.81 last August. That's led to activist investor Bill Ackman's Pershing Square Capital Management, one of Valeant's largest shareholders, taking over two positions on its board of directors. The board is seeking a new CEO, though it's unclear if Pearson, Valeant's CEO since September 2010, is resigning or has been fired. In midday trading, shares of the Laval, Quebec, company were up 58 cents, or 1.8 percent, to $32.57. Valeant is one of several companies targeted in a drug price probe by the Senate Special Committee on Aging. Pearson didn't appear at a deposition scheduled for last week, despite the committee's subpoena. The committee then announced plans to start legal proceedings against Pearson. Valeant's board directed him to comply with the subpoena. "We look forward to hearing Mr. Pearson's testimony," the committee's chair, Sen. Susan Collins, and ranking member Sen. Claire McCaskill said in a statement. "This deposition and investigation are about better understanding the dramatic price increases we're seeing for decades-old prescription drugs and how those prices are affecting consumers." Pearson remains under subpoena to appear before the committee at a hearing scheduled for April 27, the statement noted. Valeant is under the microscope because in recent years, it has repeatedly bought up small drugmakers, then jacked up prices of old, off-patent drugs with little competition as much as five times what they had been for years. Several other companies have done the same, most notably privately held Turing Pharmaceuticals — whose former CEO, Martin Shkreli, gave the pharmaceutical industry a black eye by hiking the price of a life-saving drug called Daraprim by 5,000 percent, to $750 per pill. Besides making drugs unaffordable for many patients, the price hikes and high prices for many new drugs — some costing $100,000 or more for a course of treatment — are straining the budgets of government health programs and of insurers, who are demanding bigger discounts off staggering list prices. Amid the scrutiny, Valeant said it now will stick to modest or no price increases, though it's raised prices for most of its drugs about 10 percent already this year. It's in talks to sell noncore assets to pay down some debt. The aging committee has held two prior hearings since December on drug prices, with witnesses including pharmaceutical company executives, industry investors, experts on drug pricing, medical providers and government officials.